At the beginning of Whisper My Name, twelve year old Meriel is travelling 'home' to England from India. Her mother had died, and her father, who is almost penniless, is sending her to London to live with her grandfather, believing that this will be the best thing for her. Meriel is bitterly resentful: she's already lost her beloved mother, and now she is losing her father and her home as well. The one thing that keeps her going through the next few years is the hope that she will eventually be able to go home to India. But on her sixteenth birthday - marked by the usual tests and the gift of a box of pen nibs - her grandfather tells her that this is not going to happen. Her father has no means of paying the fare, and her grandfather expects her to stay with him until such time as she makes a suitable marriage. Her ambition is to be an actress - not a suitable calling for a girl of her class. I can't say any more about what happens because it would spoil the book for you. What happens is intriguing and unexpected; we are given glimpses into aspects of Victorian life which certainly I knew virtually nothing about. Meriel is a powerful and colourful character; sometimes, I found her a little too powerful: she constantly forges ahead doing what she thinks she must, without considering the effect of her actions on people she is fond of. But she certainly makes life interesting. The character of Sophie, the young medium, is an interesting counterpoint - subtle where Meriel is brash, thoughtful where Meriel is headstrong. The story is a great page-turner, colourful and passionate and vivid - definitely recommended for teenage girls. But one quibble - why on earth is the default cover for historical fiction a girl with her head chopped off? (Not literally - I mean that the picture shows her face only from the mouth down.) I remember going to a talk by Philippa Gregory years ago where she commented on this curious phenomenon - how can this still be the design du jour? It's almost as if it's saying that the girl's individuality is not important, when the book itself says exactly the opposite. Very strange. 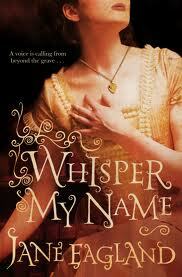 Whisper My Name is published by Macmillan, and costs £6.99. Thanks for a great review, Sue - much appreciated. Re the cover: ggrr! Don't get me started. I wanted something darker and spookier, and less soppy! Several people have said it made them expect a romance, which is misleading. Ho hum. I sympathise with the feelings about the cover - and something darker and spookier would certainly float my boat - but I think I can guess why these covers are so popular. Because you can't see the girl's face, you're invited to supply your own idea of what she looks like. It's a way of asking the reader to identify. Also, chopping the picture off like this suggests someone moving too quickly to be caught in the frame, so it suggests action, movement, excitement. Discuss, one one side of the page only. It was a pleasure, Jane! Sue, I see what you mean about the reasons for the headless woman syndrome - my chief objection is its ubiquity! (Ooh, there's a fine word for a Monday morning! I mean - someone came up with the idea years ago, and it was very striking then - but it's been used, and used, and used again since then. Laziness, surely? I suppose it could be said that it gives readers a clear signal as to what kind of book it is - but as Jane says, in this case the signal is misleading.